Chattanooga, Chatty to the local folks, is resting on a little hilltop in Southwest Oklahoma. When you live here you have a constant companion ... wind, winds that sweep through like a fast moving train taking the hat right off your head. It's known for rolling tumble weeds, prickly mesquites and dusty skies. It's know for the howl of the coyotes and wolves echoing through the darkness. Best of all, it's known for the kind hearted folks that call Chattanooga their home. The first pioneers to this area arrived at the Kiowa-Comanche-Apache opening on August 6, 1901. The foresight and dreams of these early pioneers saw the possibilities in this vast prairie land and their dedication to hard work resulted in the building of a town... Chattanooga. On a hot 22 day of July, 1902, Nelson C. Sisson filed the town site plat and named this new town after his own hometown of Chattanooga, Tennessee. Sisson set up a make shift post office in the front room of his two room bachelor house. Some time later, Sisson returned to his beloved Tennessee. John S. Lozier was the surveyor who laid out and platted the town site located 25 miles southwest of Lawton, which was approved by E.A. Hitchcock, Secretary of the Interior, Nov. 26, 1902. The original town site consisted of 160 acres, divided into 45 blocks, with about 10 acres in the northeast corner reserved for schools and parks. The north and south streets were named for Presidents of the United States, beginning on the west with Washington, then Adams, Jefferson, Madison, and strangely enough the next was Thompson, followed by Monroe, Jackson and Van Buren. December, 1902, a patent was issued to N.C. Sisson, Chattanooga, Oklahoma; T.E. Richey, El Reno, Oklahoma; and E.C. Blake, address unknown to form Chattanooga Town Co. A copy of the original states: " Chattanooga Town Co." with a capital stock of $16,000.00, created for the purpose of buying and selling real property and the improvement of the same, to exist twenty years with the principal place of business at Chattanooga, Oklahoma signed by Wm. Grimes, Secretary, Oklahoma Territory, Guthrie, Oklahoma Territory. to meet the famous hunter, Jack "Catch-em-Alive" Abernathy. Known for his unique ability to catch timber wolves with his bare hands. 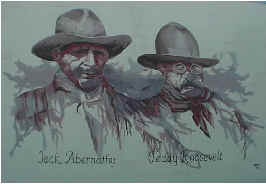 Abernathy impressed President Roosevelt who had appointed him U.S. Marshal. This bit of history is preserved with a mural of Roosevelt and Abernathy on the out side wall of the Southwest Data Center, which is now the location of the Chattanooga Elementary Annex. On Jan. 14, 1904 an additional 80 acres adjoining the town site on the east was platted by A. J. Mangan, now known as the Mangan Addition. The names of Presidents continued on these streets. The east and west streets were numbered from First on the south, through Second, Third, Main/Fourth through Eighth. Main, however; did not become the principal business street, but instead business houses sprang up on Third which is still today, the leading business street as well as State Highway 36. The pioneers say the northwest part of the town site originally set aside for schools and parks, was low and flat and found to be unsuitable for these purposes. The park was never developed and the school finally selected a site two blocks further south on higher ground. Chattanooga gradually became a bustling town with three lumber yards, three cotton gins, three saloons, two drug stores, six or seven grocery stores, two hotels, several livery stables, two hardware sores, a meat market, two banks and a real estate office. It is said that in the early 1900's Chattanooga had a population of 1200 people for a short time. Today, 100 years later, Chattanooga is on the outskirts of the hustle and bustle with a general population of 445 to 450. To the many Chattanooga residents, our little town is as comfortable as an old boot. Everyone knows everyone, when you dial a wrong number, you just go ahead and talk ten minutes anyway. The people are always willing to help others, most of the folks are so generous that the only thing they wouldn't part with is an unkind word. began construction of it's line toward Chattanooga in 1902. This furnished employment for many. The railroad skirted the town across the south. The depot was first built about one half mile west of town; later it was moved back east into the town limits. The railroad served Chattanooga until the 1930's, then buses and truck lines took over. One of the most noted persons to come from Chattanooga is Miss Rosemary Hogan. Rosemary became known as "the Angel of Bataan," after World War II. She was born at Ahpeahtone, Okla. March 13, 1912, but graduated from Chattanooga high school. Rosemary worked part time for George Gutshall in the Chattanooga Mercantile Co. store. She won a scholarship offered by Dr. Kerr and took nurse training at Scott & White Hospital in Temple, Texas. After graduation she entered the U.S. Army, and when war broke out with Japan, she was at Bataan hospital. Rosemary refused to leave the wounded there, until ordered out by General McArthur. On the way to Australia her plane was forced down and she was captured by the Japanese and taken to Manila. She ministered to the prisoners in the prison hospital there for three years - until the end of the war. She was awarded the Purple Heart and received letters of commendation from President Roosevelt and General George C. Marshall. located downtown Chattanooga was founded in memory of George W. Goodknight, 1911- 1989. George Goodknight was born and raised in Chattanooga. He worked in cattle his entire life and owned and operated Goodknight Feed Lot. The mural is a photo of Goodknight. 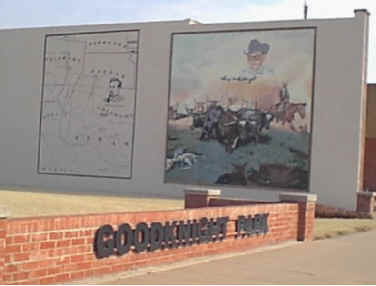 The map mural depicts the cattle trail that was made by Charles Goodknight an ancestor of George Goodknight. Over the years, Chattanooga has hosted many July 4th and Labor Day Celebrations. They have enjoyed the traditional Rodeos, Three Wheel Rodeo's, Street Dances, Bull Riding Events and Outhouse Races. A favorite is the Outhouse race which begins with brightly painted outhouses that are mounted on wheels. The outhouse team consists of a sitter and chauffeured by four pushers. As the race begins, the outhouse is pushed through the streets to designated stations with the sitter perched inside. At station #1 the sitter jumps out, seizes a bottled beverage, chugs it as fast as possible. At station #2 the sitter dons gloves, riffles through a catalog to a pre-selected page, tears it out and is on the road again. Station #3 calls for throwing a roll of toilet paper into a pail. The last assignment is to unroll and entire roll of paper, throw it into a basket and speed across the finish line. The fastest time - wins. George F. Gutshall moved to Chattanooga from Lawton September 10, 1912. He owned several businesses and in 1929 was deeded the Big Ben service station as payment as a debt. 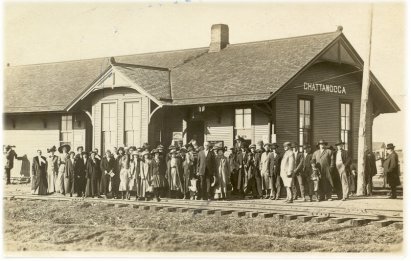 The station was constructed and named by Ben Baker, Chattanooga post master. "I sold the first gallon of gasoline ever sold here," he grinned. "I think I got a nickel per gallon. That was the price of kerosene." George married Irene Rhinefort, a Lawton school teacher. The couple had one son, George F Gutshall, Jr. who was killed during battle in World War II. Mr. Gutshall, being a very civic minded person, and especially interested in young people, established the George F. Gutshall, Jr. Award. This award, originally an inscribed gold medallion, but now a plaque, is given on graduation night to an outstanding senior selected by the faculty. It is considered by the Chattanooga School as the highest honor award given.